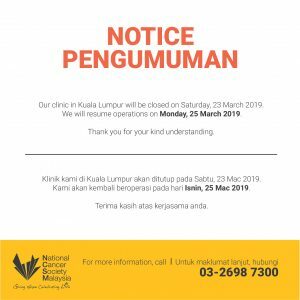 Last year, NCSM in collaboration with Etiqa Insurance & Takaful, empowered women across Malaysia by offering free mammograms for more than 5,000 underprivileged women. 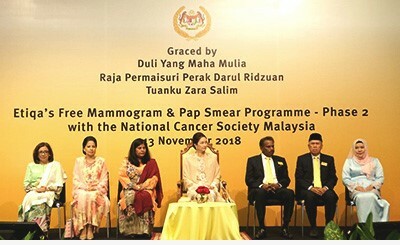 Riding on the success of the first phase, the second phase of the programme was launched, where we will provide 6,000 more free mammograms as well as 3,000 free cervical cancer screening for women from household incomes of RM5,000 and below. On 13 November, an official launch of the second phase of the programme was held. The event was attended by the consort of Our Royal Patron, The Sultan of Perak, DYMM Raja Permaisuri Perak Tuanku Zara Salim, and management and staff of Etiqa Insurance & Takaful and NCSM. Thank you Etiqa Insurance & Takaful for your support. Together, we can fight cancer. DYMM Raja Permaisuri Perak Tuanku Zara Salim with one of the beneficiaries from Malaysian Blind Association.